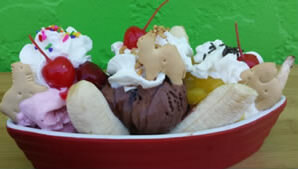 Pinocchio’s Original Italian Ice Cream is a landmark destination for Sanibel Island residents and vacationers since 1980. Some say it is the first stop on the island before checking into their hotel and the last place they visit before leaving the island. Why do so many loyal fans love coming to Pinocchio’s and why do we think Pinocchio’s franchises are a good consideration in your hometown? All Pinocchio’s Life is Cool! Original Italian Ice Cream® stores make their own frozen confections. YOU can control the quantity of what is produced based on YOUR current demands leaving little to no waste and no aging of products. Pinocchio’s Ice Cream offers something for everyone including homemade original recipes for ice cream, gelato, frozen yogurt, sorbet, sorbetto, sherbet and Italian custards. Pinocchio’s Life is Cool! Original Italian Ice Cream® is known for their repertoire of 130+ unique flavors of frozen confections that are their own intellectual property. Examples are: Sanibel Krunch©, Dirty Sand Dollar©, Wedding Bells©, Gator Stew©, Flying Pig©, Couch Potato©. Your Monkeys Uncle©, Your Monkeys Aunt© to name a few. Creating fun, unique flavors is the creative core of Pinocchio’s Life is Cool! Original Italian Ice Cream. Pinocchio’s Life is Cool! Original Italian Ice Cream® stores are known for their generous portions. All cups, cones and products are served by the number of flavors and not by the number of scoops. Ice Cream is not weighed. Songs are only sung by loyal Pinocchio’s Customers who will attest to the generous portions that keep them returning for more. There Are No Corporate Monthly Minimum Spend Requirements. YOU make the product. YOU control the quantity and YOU share this with YOUR Customers by giving them generous portions. Unique to the brand is are our signature animal crackers on top of each Pinocchio’s product for over 20 years. If it does not have an animal cracker on top, then it is not from Pinocchio’s! Interested in learning more about the Pinocchio’s Life is Cool! Original Italian Ice Cream® brand? Contact us for more franchise information today! Pinocchio's Original Italian Ice Cream is currently accepting inquiries from the following states: Florida.